Throughout all my years of being a mom, I can say with 100% certainty that my favorite gifts have been homemade. A handcrafted bracelet, a jar of carefully collected rocks, or even a simple card often carries more meaning than anything money can buy. Gifts of food come from the heart, too. Many moms are greeted with breakfast in bed on their special day, and I know quite a few dads who would be thrilled by a similar wakeup call. Crunchy pretzels have long been my husband’s snack of choice. On the occasional trip to Park City (our local mall–not the ski resort in Utah ; ) ) however, he beelines for a warm, yeasty soft pretzel. Over the years, I’m pretty sure he conjured up a trip or two simply for the soft pretzels. The following recipe is a make-at-home option that’s as enjoyable to create as it is to eat. There’s a simple technique for creating the trademark brown “skin,” but there’s also a timesaving shortcut that keeps the focus on the fun. Getting the knack of twisting these savory snacks into the traditional pretzel shape is entertaining in and of itself, but the optional personalization makes them especially gift-worthy. After the requisite letters have been formed, my kids have created pretzel snakes, caterpillars, and abstract art forms. For a long time, I kept a bag of the frozen dough on hand for a fun activity any time of year. And luckily, no matter what the finished pretzels look like, everyone’s always delighted to eat them. Of course, on Father’s Day, a bacon-and-egg breakfast is still a good call. 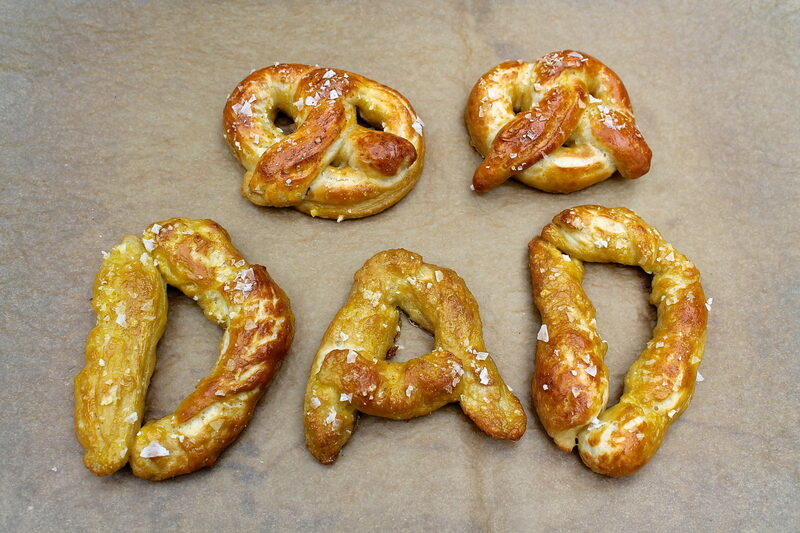 But spelling Dad’s name out in pretzels is sure to make his day memorable. 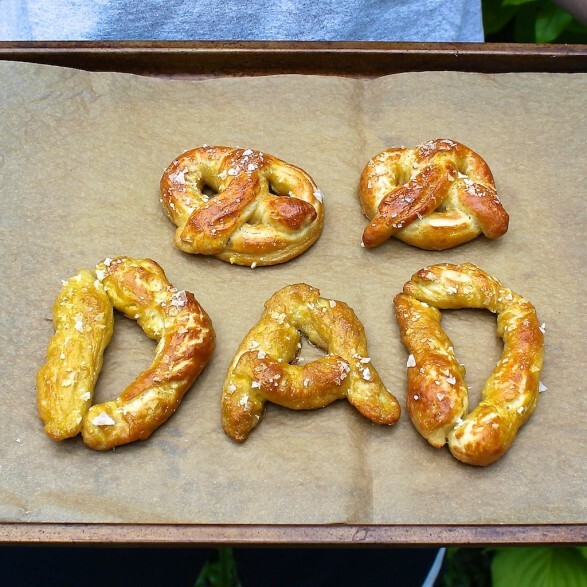 Whether making the traditional pretzel knot or personalizing for a fun gift, these make a fun activity and a delicious savory snack any time of year. Thaw the amount of dough you wish to use according to package directions. When the dough has thawed, preheat the oven to 450 degrees F. Line a baking sheet (or two if you are making a bigger batch) with parchment paper and lightly brush with vegetable or olive oil. (The dough will stick to the paper if not oiled.) Set aside. Gently roll and stretch a piece of dough (one roll equals one pretzel) into a long, thick rope. The dough should be about 15 inches long. This is a good estimate, but after you make one, you’ll get the feel for the size and shape of pretzel you like. 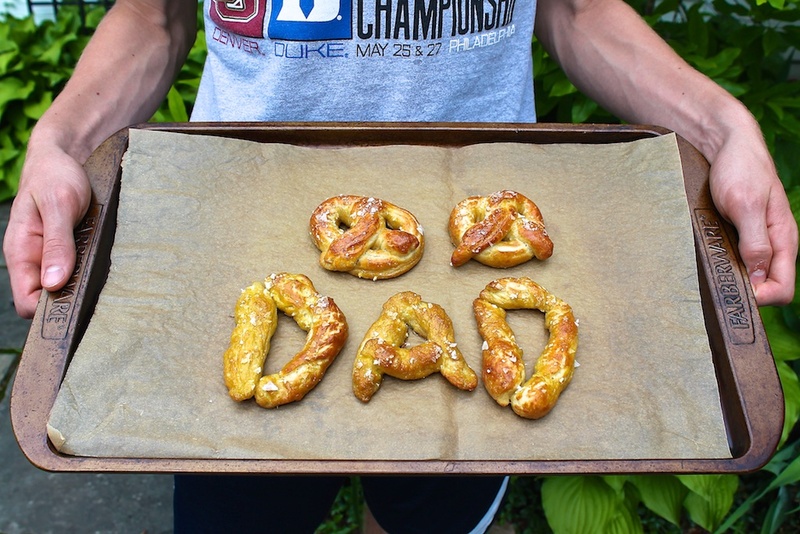 To make a traditional pretzel, form a U-shape with the rope. Holding the ends of the rope, twist them around each other twice, and then press them onto the bottom of the U. If you’re having trouble getting the ends to stick, use a little water to act as glue. Place the shaped pretzels on the parchment-lined baking sheet. You can also make letters, rods, or any other shape you like. In the meantime, bring the 10 cups of water and the baking soda to a rolling boil in a large saucepan or medium stockpot. Stir once or twice to dissolve and incorporate the baking soda. Using a large spatula, place the pretzels into the boiling water, two at a time, for 30 seconds. Remove them from the water using a spatula or slotted spoon that will allow the water to drain through. Return the pretzels to the baking sheet, and then brush the top of each pretzel with the beaten egg yolk and water mixture. Sprinkle with the salt. Bake until the pretzels are evenly dark golden brown in color, approximately 11 to 14 minutes. Check a few minutes early, rotating the baking sheet if the pretzels on one side of the sheet are browning faster than the other. Transfer to a rack for 5 minutes before serving. Serve warm with mustard, if desired. Wrap and store any leftovers in the refrigerator or freezer. For best taste, reheat gently in a toaster oven or regular oven. I typically buy Rhodes Bake-N-Serv™ Dinner Rolls. They are sold in 12- and 36-count bags and can be found in the frozen foods section. Thaw the desired amount and store the rest in the freezer for future use–as pretzels or dinner rolls. To make these a sweet treat, you could sprinkle with coarse, turbinado sugar instead of salt! I started using it on my homemade bagels a few years ago; kind of a sweet variation of my salt bagels that are sprinkled with kosher salt, & they are a big hit with my friends & family! Then make a sweet cream cheese spread to dip them in.